USA Today reports that a new version of the New International Version will hit bookstores in March, 2011. 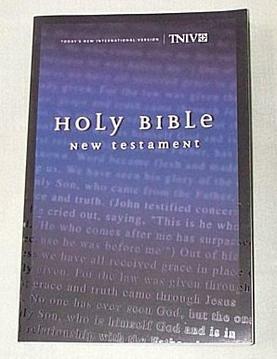 The translation takes into account the criticism that the Committee on Bible Translation – who first created the NIV in 1978 – received from their 2005 edition of the Today’s New International Version, which featured inclusive language. That is, places where scripture refers to man or mankind, words like people or human beings were used instead. As you may remember, this change did not fly with some big time evangelicals like James Dobson and John Piper. Apparently they asked the Committee not to produce a gender inclusive version of the Bible and when the TNIV was released anyway, “Dobson accused translators of distorting the word of God,” according to the USA Today article. So, in the new version of the NIV most of the original gender-exclusive language was retained, though not all. This is particularly poignant news in light of the discussion (which I’ve been involved in) transpiring in the comments section of Sessions’ post on Molly Worthen’s New York Times Magazine article. This debate shows that the translation of scripture is being influenced – always has been influenced – by political debates and, in this case, threats of being perceived too liberal by the version’s target audience. If the point of creating new translations is to make scripture accessible to contemporary readers without compromising the original text (to the extent that that’s possible), refusing to let “human beings” stand in place for “man” – as in “Let us make human beings in our image, in our likeness…” – can’t be anything more than political posturing. Clearly, the meaning is not changed, contemporary readers understand “man” to include men and women, and yet the TNIV was the object of scorn from many evangelicals. Are they really afraid that offering inclusive language will alter the meaning of scripture, or could they perhaps be afraid of something far more insidious?